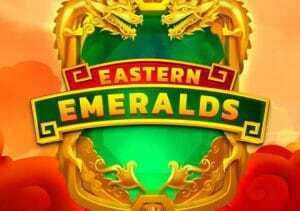 A beautiful Chinese valley is the setting for Eastern Emeralds, an Asian-themed video slot from Quickspin. It’s a 5 reel, 20 payline game that comes with high end sound and visuals as well as wild multipliers that can combine to boost payouts by up to 1,680x as well as a free spins feature where you can alter the volatility. Play from 20p to £100 per spin. Quickspin video slots usually come with plenty of flair on the design front and Eastern Emeralds is typically easy on the eyes and ears. A valley shrouded in mist forms the backdrop to the reels. There you’ll see Asian-style royal values as well as golden bowls, coins and tortoises. Helping to create those winning combinations are a series of wilds. As well as performing the usual substituting duties they also boost payouts by up to 8 times your bet. Better still is that multipliers combine if you land more than 1 of them in the same winning line. Say for example, you landed 2x and 3x multipliers in the same winning combination. The payout would then receive a 6x multiplier boost. This is a rather simple game but none the worse for that. As we’ve come to expect from Quickspin, there are no complaints about the imagery or the Asian-style backing track playing in the background. The game hinges on the wild multipliers. You can expect them to land regularly which keeps the pace moving along at a decent gallop. This isn’t a very volatile game though with the variance in the low to medium range. Rather basic it may be but Eastern Emeralds is an enjoyable enough game thanks to the multiplier wilds. Get lucky with those wild combinations in the Destiny Bonus feature and this latest trip east could be a memorable one as you can win 16,003.7 times your bet on each free spin. If you like big multipliers, there’s a potential 300x multiplier in the volatile 300 Shields from NextGen Gaming.